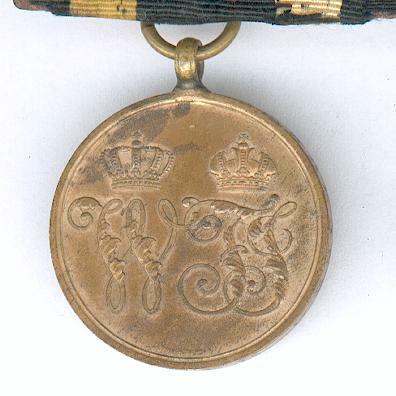 Commemorative Medal for 1864 for combatants, from the bronze of captured Danish cannon (PREUSSEN. Kriegs-Denkmünze 1864 für Kämpfer, aus der Bronze eroberter dänischer Geschütz), 1864. 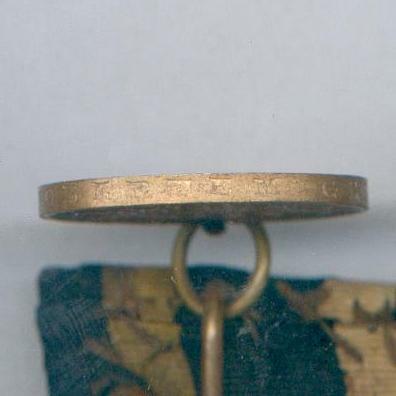 Circular bronze medal with laterally-pierced loop for ribbon suspension; the face with the crowned ciphers of King Wilhelm I of Prussia (left) and Emperor Franz Joseph of Austria (right); the reverse inscribed ‘UNSERN TAPFEREN KRIEGERN’ (Our brave warriors) and dated ‘1864’ within a circular laurel wreath; the edge inscribed ‘aus erobertem geschuetz’ (from captured cannon). 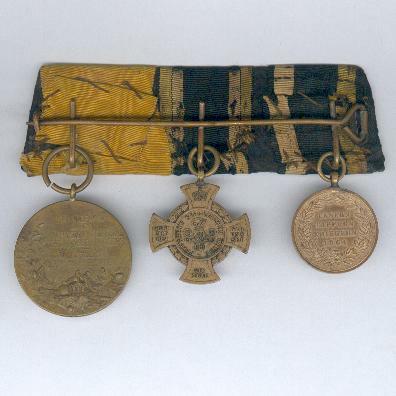 The medal, instituted on 10 November 1864, was produced for both Prussian and Austrian forces active in the war against Denmark from captured Danish cannon, that for Prussia being manufactured by the Royal Mint at Berlin. That for Austria had the cipher of Emperor Franz Joseph on the left. In 1863 the Danish Liberal government persuaded the new Christian IX, to sign a joint constitution for the Kingdom of Denmark and the Duchy of Schleswig, the majority of whose inhabitants were German. This contravened the agreement that had ended the war of 1848 to 1850 and Prussia, keen to annex Schleswig-Holstein, invaded on 1 February 1864. Austria, fearful of giving Prussia a free hand, also sent forces. The Danes faced superior numbers, training and equipment and by the time of an armistice on 12 May, most of Denmark was occupied. Negotiations failed and war broke out again on 26 June. Fighting finished on 20 July in total defeat for the Danes and, under the treaty signed on 30 October Schleswig Holstein came under joint Austro-Prussian administration. In 1866, following the defeat of Austria by Prussia, the latter annexed both Duchies. Bronze cross pattée alisée, a laurel wreath between the arms, with ribbed loop for ribbon suspension; the face with a circular central medallion bearing the cipher ‘WR’ for King Wilhelm I, circumscribed ‘PREUSSENS SIEGREICHEM HEERE’ (Prussia’s victorious armies), the Prussian crown on the upper arm of the cross, the left, right and lower arms inscribed ‘GOTT WAR MIT UNS. IHM SEI DIE EHRE’ (God was with us. To Him be the glory); the reverse with a circular central medallion bearing the crowned Prussian royal eagle perched on a cannon, the upper, left, right and lower arms inscribed ‘TREUEN’, KRIE-’, ‘GERN’, ‘1866’ respectively. The Medal was instituted by King Wilhelm I on 20 September 1866 following the victorious war against Austria and its German allies. There were four versions: for those present at the battle of Königgrätz, for the Army of the Main, for ‘Trueue Kriegern’ (for those ‘loyal soldiers’ not present at Königgrätz nor part of the Army of the Main) and for non-combatants. This example is of the third version. 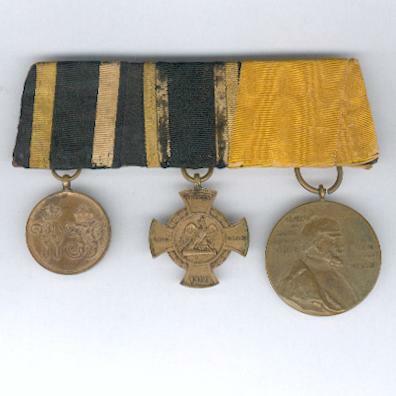 The medal was cast from the bronze of captured Austrian cannon. GERMAN EMPIRE. Kaiser Wilhelm I Centenary Medal (Kaiser Wilhelm I Zentenarmedaille), 1897. Large circular gilt bronze medal with loop for ribbon suspension; the face with a head and shoulders portrait of Kaiser Wilhelm I in full military uniform facing right, inscribed ‘WILHELM DER GROSSE DEUTSCHER KAISER’ (Wilhelm the Great German Emperor) and ‘KOENING VON PREUSSEN’ (King of Prussia); the reverse inscribed ‘ZUM ANDENKEN AN DER HUNDERSTEN GEBURTSTAG DES GROSSEN KAISERS WILHELM I 1797 - 22 MAERZ - 1897’ (In commemoration of the hundredth birthday of the great Kaiser Wilhelm I 1797 - 22 March – 1897) above a cushion bearing the Prussian (Hohenzollern) crown and orb imposed on a sword, a laurel branch to the left, an oak branch to the right. The medal was awarded on 22 March 1897, the hundredth birthday of Kaiser Wilhelm I, to all military on active service and to the veterans of the wars of 1864, 1866 and 1870. It was made from Danish, Austrian and French cannon captured in those wars, designed by the artist Walter Schott (1861-1938) and produced by the Berlin medallists Firma L. Ostermann, founded in 1812 by Gottfried Bernhard Loos (1774-1843). Kaiser Wilhelm I (1797-1888) became King of Prussia in 1861 and Emperor of a united Germany on 18 January 1871. His reign was most notable for the unification of Germany under the guidance of Otto von Bismarck and its rapid industrial and economic progress. The Group is on its original somewhat tired parade mounting.